In purely formal terms, the lasting significance of Alexander Sokurov’s Russian Ark relates to how such a seemingly simple device – filming for 96 minutes in one unbroken shot – can call into question so many of the traditional tools of film studies. Granted, it is not quite so simple as this on closer inspection: the film’s complex temporal shifts, the ambiguous identities of both the film’s on-screen guide and unseen spectator and the strange relationship that begins to develop between them all create tensions which make a first viewing a bewildering enough experience had the film been composed in a traditional multi-shot manner. But there is something in the way these elements feed into each other, dancing around each other like the characters in the film’s spectacular closing ball scene, which somehow creates the elegant tapestry above what is a messy underweave. The presence of two, rather than one, near-omnipresent travellers across the halls of the Hermitage museum and the history of Western civilization creates a formal tension between the idea of mimetic and diegetic narration. The guide, later identified as Marquis de Custine, appears able to interact with the rest of the cast of characters, and seems to be steering the direction of the narrative, ‘telling’ the story of the film. By contrast, the unseen character aligned with the camera seems to be invisible, at once an ideal spectator and a passive observer being ‘shown’ what is happening. Which of these is the audience to identify with, if either? The latter would be the conventional answer, given that the former is the ‘ghost’ of an identifiable historical character, yet within the diegetic world of the film, the real ‘ghost’ would appear to be the apparently unseeable one aligned with the camera. Other well-defined tools of film theory either prove entirely inadequate or in need of some degree of modification. The concept of ellipsis, usually defined as a break in time occurring between shots, seems to struggle under the film’s temporal leaps within the same shot, and it seems to spit in the eye of the Bazin’s idea of real-time ‘duration’; relative to this, a temporally difficult film such as L’année dernière à Marienbad (1961) seems positively straightforward. And what of Jean-Luc Godard’s assertion that a tracking shot constitutes a moral statement? This seems to buckle considerably when stretched to a 90 minute duration. There also seems to be more than a little irony in the fact that it should be a Russian filmmaker’s work which calls into question many of the assumptions and aesthetic strategies laid down by the Soviet Montage directors and theorists, whose work came to define much of the first century of cinema. 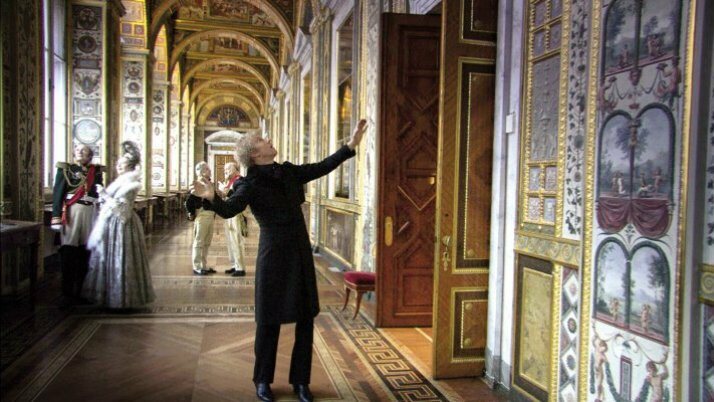 Russian Ark may be a continuum, but it is a film of many moments, some of such beauty as to touch the Kantian notion of the sublime, heights which even many a great film fails to do. At times the cumulative effect is overwhelming, like trying to immerse one’s vision at the entirety of the ceiling of the Sistine Chapel. It is curious that the other notable film to attempt a similar technique, Alfred Hitchcock’s Rope (1948), did so in order to derive dramatic tension, a feeling of claustrophobia and of no escape for its murderous protagonists. Here, Sokurov creates the very opposite,and as the camera glides and floats around the corridors of the Hermitage it seems only to obey the freewheeling logic of a dream. Any analysis of film form necessarily asks if the film could have been improved by employing a different aesthetic approach. The answer? Sokurov’s philosophical aims are certainly achieved, hinting at the elasticity of time beyond our narrow perception of it, and that through art we are given the chance to be granted a kind-of eternal life. Is this enough to sustain a feature-length film? I would admit that I find there to be long stretches of the film which are bereft of any real interest aside from the innate splendour of the objects d’art on display; is the film’s duration entirely necessary, or merely a requirement for it to be viewed as a conventional film and thus reach the widest possible audience rather than be marginalised as a minor experimental piece? Or is it merely a piece of headline-grabbing directorial grandstanding? There is no denying the spectacle of such an achievement. But the technical marvel at such an undertaking creates its own problems; unlike, say, Chris Marker’s La jetée (1963), another notable formal experiment in cinematic form, the technical virtuosity of Russian Ark seems at times to call attention to itself too much. As such, the lack of any cuts can actually have a counter-intuitive effect of rupturing the suturing of the viewer into the diegesis, and it is understandable that this has caused a distancing effect for some of its more severe critics (myself included). Is this a flaw? It seems one inherent in any similar undertaking. Given the presence of technology capable of doing it, a one-shot feature will almost certainly be attempted again, and it will no doubt raise these very same issues. Perhaps with hindsight after this, when an aesthetic framework capable of analysing it has been developed and when viewers are used to the technique, we will be able to see just how truly daring Russian Ark really is. As it is, it remains a grand, beautiful, challenging if problematic singularity. This post originally appeared as a response to the screening of the film as part of the Watershed’s Decalogue season of significant films of the 2000s. Blimey, great piece man. That film sounds absolutely fascinating. In fact, I’ve just watched the first 10mins on YouTube and my head is spinning. Those crazy Russians, they’ve really got a way with film that’s all their own. I will definitely find a DVD copy of this and report back. Thanks for pointing me in the direction of something new. It’s such a one-off that it’s worth a watch even if you end up disliking it. I am certainly not its greatest fan and have many problems with it, but would not dissuade anyone from seeing it, since it is such an interesting anomaly in the cinematic canon. Even if you don’t like it, the arguments and debates it raises are fundamental to any appreciation of what cinema constitutes, and ultimately why we find such discourses so fascinating.